This week, we’ve been working on Sprint Two, which is focused heavily on power management systems. The rover that you play as is capable of functions like driving, scanning, mining, etc. Our goal is for all of these functions to balance against a power usage strategy. This provides a sense of cost and significance to our player’s gameplay choices. We want to make this power budgeting something that’s actually fun for the player. It’s not there yet, but now that the power system is in place, we are working hard to fine tune values through internal play testing. Perfecting the power management system will, undoubtedly, require a lot of trial and error. All is well though, because while our testers are working to determine ideal balance variables, our programmers are beginning work on the Resource Gathering systems. This involves mapping resources across the asteroid, and putting in place the mechanics for gathering water ice, iron, gold and other valuable ores. It’s important these mechanics create a satisfying sense of searching and collecting, without exhausting players. I’m getting a little ahead of myself though, and I’ll talk more about that next week! 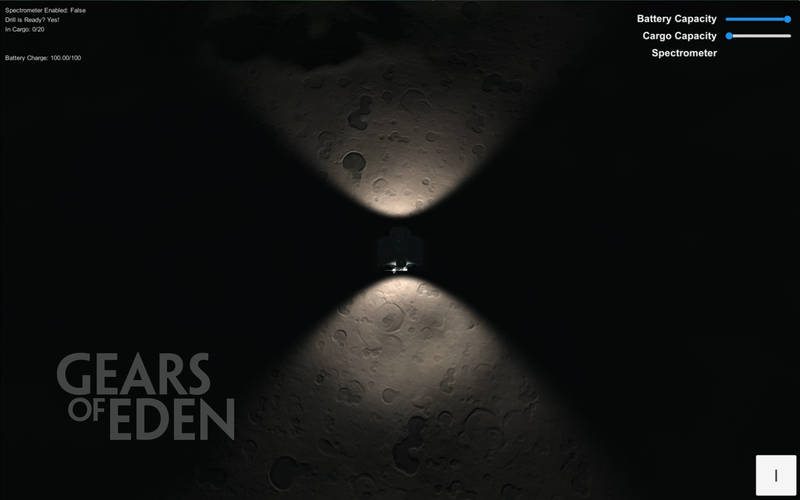 Gears of Eden is a work in progress, and we always have something new to talk about. To get the latest updates as soon as they come out, follow us on Twitter and Facebook! Also, don’t forget to sign up for our mailing list, especially if you’re interested in the possibility of alpha testing. Thank you!